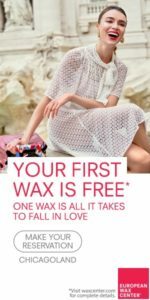 European Wax Center is offering a free wax for first time clients – choose from an eyebrow, bikini line, underarm, nose or ear wax. Go ahead and flaunt some seriously smooth skin. 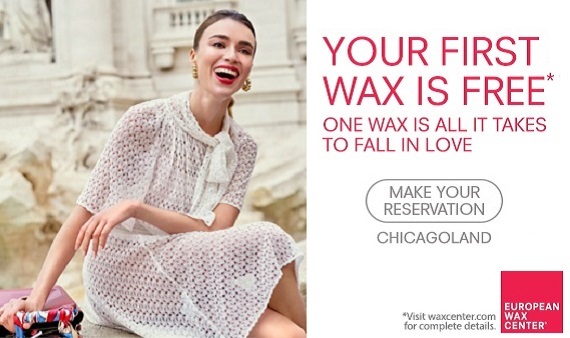 European Wax Center has more than 20 Chicago area locations. Free wax for first-time guests only. Please mention StyleChicago.com when making your appointment. Valid only for select services. Participation may vary and additional terms may apply. Reservations can be made online or over the phone at more than 20 Chicago area locations. To make an appointment and read more about the company, please visit their website. At European Wax Center (EWC), they’ve always believed that revealing beautiful skin is the first step to revealing your best self. Whether you dress bolder, speak louder, or chase your dreams harder after a day of pampering at one of our centers, they think every woman who leaves EWC shouldn’t just walk out… she should strut out. We are so happy to have European Wax Center onsite along with 100+ of Chicago’s finest artisans in food, fashion, home goods + art at the Chicago Artisan Market at Morgan Manufacturing (401 N. Morgan St., Chicago) on Sunday, March 10, 2019 from 10am-4pm. European Wax Center was founded a decade ago on the belief that all of us deserve beautiful, gorgeous skin not by concealing who we are, but by having the courage and confidence to reveal our natural, beautiful skin.